As planned Total TRIP went very well except one journey from Rameswaram to Kanyakumari. I am sure this trip will be one of the most memorable trips in my life. We reached Madhurai(Temple city) around 7:45 AM. Railway station is very near to Meenakshi amman temple and Periyar Bus stand. So we decided to take lodge near to temple. After getting refreshed in room we immediately started moving to temple.One the way we finished breakfast and reached the Temple which is 5 minutes walk from Periyar bus stop.Temple so big so it took around 4 Hrs(9 AM to 12 :30 Pm) for us to see all the temple. I paid 50 R/- to use the camera in temple premises. But we should not take the photos in any of the main temples. 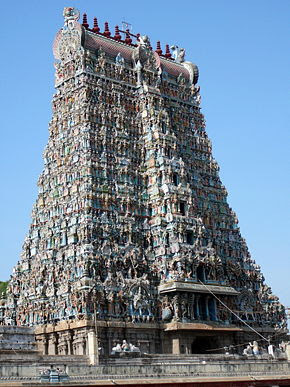 There are 12 massive gopurams in the temple, the four tallest gopurams at the outer walls (The tallest is the southern gopuram, measuring 49 metres). There are four entrances. We should enter from east gopuram .One should see the meenakshi amman first and then we have to see the sundareeswar temple.All the gopurams are covered as there is some painting work is going on. The main entrance is to the Meenakshi Amman shrine. There are two main temples in the entire meenakshi temple one is Meenakshi amman kovil and another is Sundareeswara temple.We took special darshan tickets,and entered in to temple.The good thing I observed in all the temples is, if we took the special darshan ticket we can see the god from very close. (In other places special darshan is totally intend to cross big lines easily).No doubt one who will see the Meenakshi temple closely and deeply will get rid of their sins.Meenakshi amma looks so beautiful in the oil deepas(I didn't see any electrical lights in any of the temples in this whole trip.Meenakshi amma holding a parrot and flowers in her hand looks amazing.Mukkera on her nose shines even in the dark oil lamps lighting also. Next prceeded to sundareeswar temple we are really lucky enough to see the special Rudraabhishekam performed that time for more than one hour.There are different sculptures of almost all the Hindu gods on the walls of the temple.And it is almost like a temple mall where we will find almost all the gods.Ganesha, shanmuga, sarswathi, durga, dakshina murthy, anjaneya etc. The temple plan looks like the below A lotus shaped city is said to have been built by the Pandyan king Kulasekhara around the siva linga worshipped by Indra in the forest of Kadamba trees. When Lord Siva came to bless them, nectar dripped from his matted locks & hence the city was named Madhurapuri (madhu - honey), & is now known as Madurai.The Kampathadi Mandapam and Velli Ambalam are situated in the outer corridor. The scenes from the wedding cermeony of Sundareswarar & Meenakshi are depicted in the pillars of this hall. This place is one of the 5 (Pancha Sabhais) sabhas of Nataraja where Siva dances. (The other dance halls are Chidambaram, Tiruvaalankadu, Tirunelveli and Kutralam). There is a unique idol of Nataraja dancing with his right leg raised to the shoulder instead of the left. The Lord is considered to have danced thus, at the request of King Rajasekara Pandyan. Since the idol of Nataraja is covered with silver leaves, it is called Velli (silver) Ambalam. 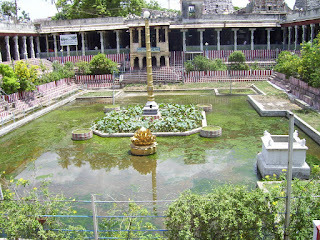 Potramarai Kulam, the sacred pond measuring 165 ft by 120 ft inside the temple is a very holy site for the devotees and people go around the lake before entering the main shrine. The etymology for the word means, the Pond with the Golden Lily and as the Lily that grows in it has a golden color. According to the legend, Lord Shiva promised to a stork that no fish or other marine life would grow here and thus no marine animals are found in the lake.In the Tamil legends, the lake is supposed to be a judge for judging a worth of a new literature. Thus, authors place their works here and the poorly written works are supposed to sink and the scholastic ones are supposed to float. Next wonderful thing in the temple is 1000 pillars Hall, which they are using it as art museum.it is also really worth seeing as they kept the all history and photographs of the temple along with the ancient sculptures and coins etc. After darshan and dinner we took 1 hr rest in room and immly at 3 PM started to Algar koil and Thripura kundam.We booked a cab for up and down journey to cover both of these places.Algar koil is 20 KM from periyar bus stop in south side where as thripura kundam is 10 km to periyar bus stop to north.so first we visited the algarkoil and then went to thripurakundam via perioyar bus stand itself. Located 21 kms northwest of Madurai is a Vishnu Temple on a picturesque wooded hill. Here 'Vishnu' presides as Meenakshi's brother 'Azhgar'. 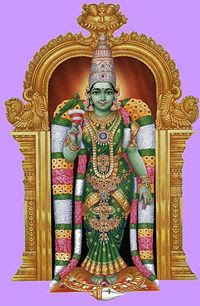 During the Chitrai festival in April/May, when the celestial marriage of Meenakshi to Sundareswarar is celebrated, Azhagar travels to Madurai. A gold processional icon called the Sundararajar is carried by devotees in procession from Azhagar Kovil to Madurai for wedding ritual.Azhagar Kovil is very old temple with long black rock statues of balaji,sridevi and budevi can be seen. Palamudhirsolai, one of the six abodes of Lord Subramanya is on the same hill, about 4 kms. above. A natural spring called Nuburagangai where pilgrims bath, is located here.to go to Palamudhirsolai we will be getting buses which will charge 10R/-.On the hill we can see subramnya swamy and mahalkshmi ammavaru as well as waterfalls. In azhagar koil we can see wondeful sculptures in different dance poses as well as narasimha swamys rare action poses. Next we visited subramnaya temple in a cave called thripura kundam.There we can see virabdra temple in the left of entrance. Then after dinner we took rest.started journey to Rameswaram next day morning. 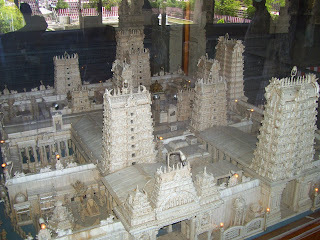 1 comments to "Trip to Madhurai-Rameswaram-Kanyakumari - 1"